Arriving at Hampton Pool at 5:45am on Easter Monday after an hour’s drive across London, I must admit I did question my sanity! It was still pitch-black dark as we racked our bikes on the soggy grass beside the open-air pool. I had won an entry to the Thames Turbo triathlon through PowerBar on Twitter, however I hadn’t realised how early the race started! This race forms the first fixture in the London League for 2015. The London League is a series of events spanning the season from April to October, comprising of triathlons, aquathlons and duathlons. These races are designed to allow triathlon clubs across London to support each others events, compete against each other and generate a healthy environment for improving performance, encouraging participation and having fun. A scoring system is in place to allow clubs to accumulate points at the London League over the season. This particular event was hosted by the Thames Turbo Triathlon Club who are based in Hampton, Middlesex. Dean, a friend from Havering Tri was also at Hampton Pool bright and early to represent our club. He assured me that the open-air pool was warmer than it looked and this would be a fantastic race to get the season off to a great start! Swimmers were set off based on their predicted time for the 426m swim. 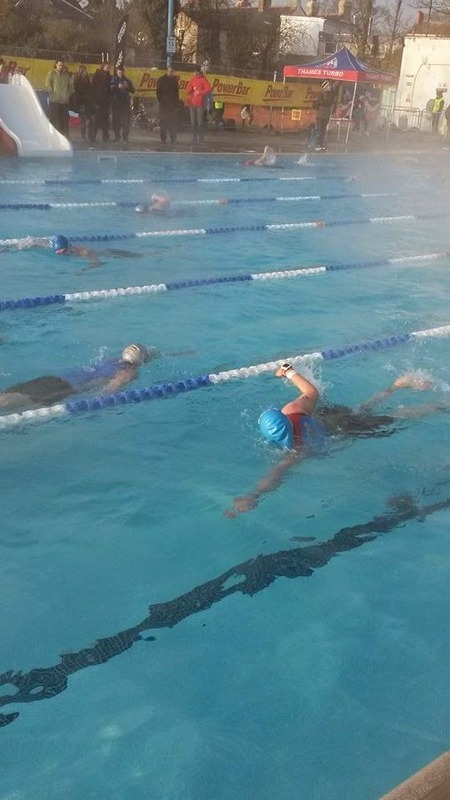 I usually consider myself to be quite a slow swimmer, so I was pleased to find out that I would be set off slightly later in the morning as there would be 241 people who are slower than me! Queuing to start the race in my lycra trisuit, I dipped my feet into the babies pool which was like a hot bath. I felt really reluctant to start the race and longed to be back home in bed enjoying the Bank Holiday. Around 7.40am, I was called over to start my wave. The marshall congratulated me on my first race in the Thames Turbo series, as he activated my chip timing and set me off into the water. True to Dean’s word, Hampton Pool was lovely and warm and I immediately realised how much I was going to enjoy this race. 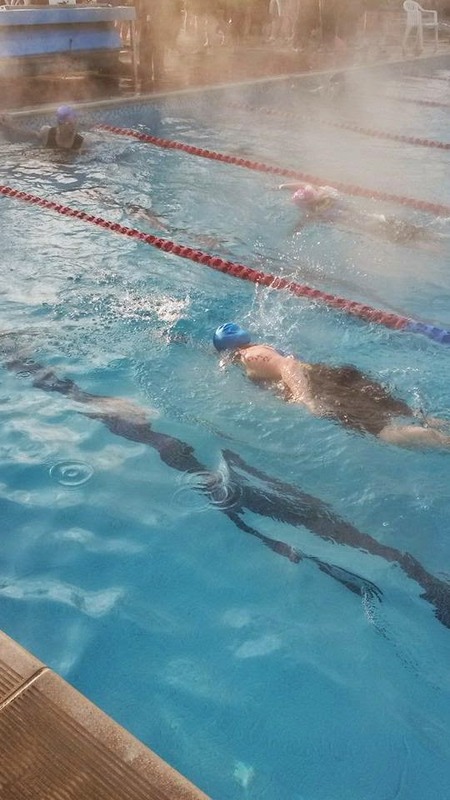 The 426m swim comprised of 12 lengths of the pool, ducking under the lane rope and moving across after each two lengths before exiting at the stairs on the opposite side of the pool. I quickly caught up with the swimmer ahead of me and tapped his feet. It’s race etiquette to move over and allow the swimmer behind you to pass, once you feel someone tapping your feet. However, this guy did not want to let me overtake! It was quite frustrating as I had to swim at his pace and couldn’t really get moving. I was out of the water in 9:10- I had hoped for a slightly quicker swim, but it was pretty much impossible to overtake the competitor ahead of me. I think I prefer open-water swimming for this reason- there is plenty of space to pass slower swimmers. Taking off my swimming hat and goggles and searching for my bike, I felt the bitterly cold morning air hit my skin. I’d left a fleece-lined cycling jacket ready to put on over my soaking wet trisuit, I’d definitely need it for the cycle. Remembering my coach Mark’s words, I put on my helmet and fastened it before un-racking my bike. I know this rule, but it’s so easy to forget and risk a penalty when you are rushing through transition. Transition 1 took 2:09. Pushing my bike out of the transition area, I headed for the mounting point on the main road outside the pool. I overtook a few people straight away and flew towards the first roundabout. 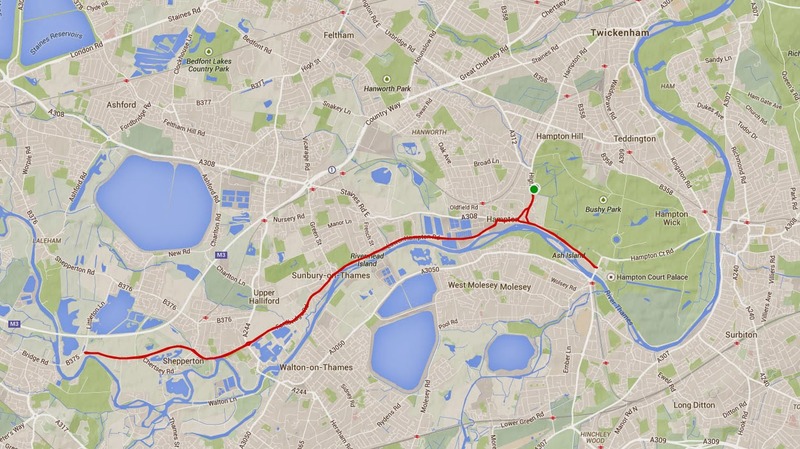 The 21.5km cycle was completely flat throughout, following the route of Thames out towards Chertsey. Being so early in the morning, the roads were empty and all I could hear was the rush of the icy wind as it whipped around me. I felt the cold water running down my legs into my cycle shoes. My legs were glowing red and my fingers were numb on the handlebars. It was not the most comfortable of rides, but I was loving every moment! We had to slow down for several roundabouts and speed-bumps, but generally this was a fast course. After cycling the mountains of Lanzarote, this route seemed a breeze so I tried to focus on keeping my cadence going. I noticed I was averaging 18mph on my Garmin watch which I was pleased with. 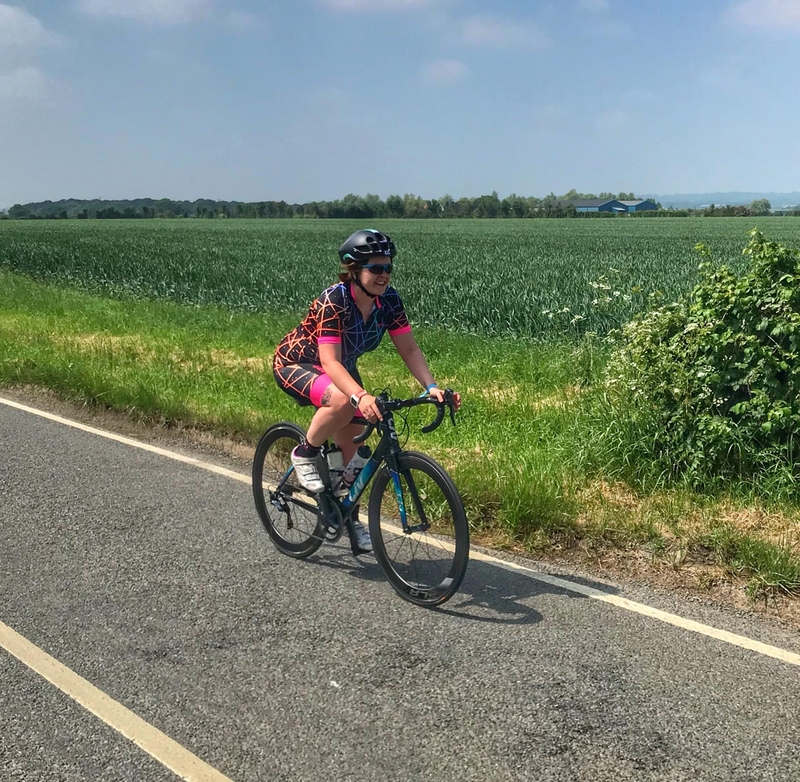 The Thames Turbo triathlon includes an area known as the ‘dead zone’ in between completing the bike section and entering transition. Your bike split time ends when you pass over the mats, but there is still a short distance to cycle back to Hampton Pool. The race organisers allow 7 minutes to complete this section, which is not included in your overall time. Anything over 7 minutes, and the clock starts again with the time added on. This was good opportunity to slow down, spin out my legs and prepare for the next section of the race. I was caught at the traffic lights at the ‘dead zone’, but it didn’t cost me any time as overall I got through this area in 5:49. I was in and out again 1:51, racking my bike, removing my helmet and cycle shoes, putting on a visor and my trainers. The 5km run took us in a figure-of-eight loop of Bushy Park which sits alongside Hampton Pool. It’s a beautiful park filled with herds of deer, water gardens and fountains. The sun came up as I ran, revealing what was to be a lovely, bright Easter Monday. I started to feel warm (but still soggy) in my cycling jacket and trisuit. Looking at my Garmin as I ran, I saw I was averaging 8:40 min/miles, so I hoped to complete the final stretch of the triathlon at ‘parkrun pace’. The course took us across rutted fields, so I tried to watch my footing and stick to the flatter parts of the terrain. The marshalls throughout the course were all fantastic, enthusiastically cheering us on by name after checking against our race number on the competitor list. A water station was situated at the half-way point, but I chose not to take any as I didn’t want to slow down! There was no actual finishing arch, so it was a bit difficult to spot where the course ended, however I did see the ‘100m to go’ sign and sped up for a sprint finish. I completed the run in 27:36, giving me a total time of 1:26:51 for my first triathlon of the season. I was pleased with my performance in the Thames Turbo, I’m so glad I got over the initial reluctance to race on such a cold and early morning! I’d pre-ordered a medal (costing £3) which I collected back at the pool, along with some nutrition samples from PowerBar. Always got to have a medal selfie! Did you race on Easter weekend? How did it go?